INDUSTRIAL DIAMOND APPLICATION MADE IN ITALY Exceptionally, for the Expo, you will have the opportunity to visit by appointment Italdiamant SpA, where you can see the qualified production of diamond tools for the processing and transformation of natural stone, quarz, ceramic and porcelain tiles. ITALDIAMANT, a world-renowned brand, is synonymous with experience, technology and quality in the production of blades, discs and diamond tools for all types of natural stone, agglomerates or synthetic materials. In business since 1976, ITALDIAMANT has grown, constantly driven to carry out research and technological and organizational innovation of its products and processes. Year after year, it was precisely in innovation and research that it invested an average of 10% of its turnover. A profound, direct knowledge of the market and the way it evolves has let the company establish longstanding, authentic partnerships with the customers. One of its winning characteristics is how it works together with customers to fine-tune customized solutions. In fact, the design and creation of blades, discs and customized sizes of tools based on the materials to be worked is done so that adjustments to plants are not required. ISO 9001 - 14001 certification is already widely recognized on the market as an important and official form of recognition in quality, reliability and constant research in the area of technology. ITALDIAMANT exports 90% of its production around the globe. With its branch in the United States and sales departments in Europe, Asia and the Middle East, it relies on an extensive sales network, keeping the company in touch with customers and their needs for years thanks to a streamlined structure. Driven by the desire to broaden its product offering by going into new fields like professional construction and controlled demolition, ITALDIAMANT decided to purchase new machinery and later, it built an extension to its facilities. Today ITALDIAMANT offers complete solutions for cutting, drilling and grinding of any material in the construction and stone industries. Equipped with modern, highly automated production means, it can produce high-performance tools and fast. ITALDIAMANT has always seen outstanding customer service as one of its fundamental objectives—one that makes a big difference in terms of efficiency, flexibility and innovation. This is something that long-time customers have truly appreciated. ITALDIAMANT has built itself a solid foundation for facing and overcoming future challenges thanks to experience, and Italian style quality! Take the opportunity with Expo 2015 to visit ITALDIAMANT! 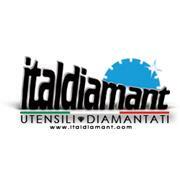 ITALDIAMANT, a world-renowned brand, is synonymous with experience, technology and quality in the production of blades, discs and diamond tools for all types of natural stone, agglomerates or synthetic materials. In business since 1976, ITALDIAMANT has grown, constantly driven to carry out research and technological and organizational innovation of its products and processes. Year after year, ITALDIAMANT was precisely in innovation and research that it invested an average of 10% of its turnover. A profound, direct knowledge of the market and the way it evolves has let the company establish longstanding, authentic partnerships with the customers. One of its winning characteristics is how it works together with customers to fine-tune customized solutions. In fact, the design and creation of blades, discs and customized sizes of tools based on the materials to be worked is done so that adjustments to plants are not required. ISO 9001 - 14001 certification is already widely recognized on the market as an important and official form of recognition in quality, reliability and constant research in the area of technology. ITALDIAMANT exports 90% of its production around the globe. With its branch in the United States and sales departments in Europe, Asia and the Middle East, it relies on an extensive sales network, keeping the company in touch with customers and their needs for years thanks to a streamlined structure. ITALDIAMANT knows what quality is!